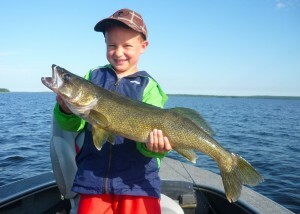 Overall, it was another very stable and strong week for walleye fishing on the southern main lake basins of Lac Seul. We had a few wimpy showers, but we are still incredibly dry and are still seeing smoke on the water every other day. The fires continue to burn to the north and you can see the dry conditions beginning to affect the forest, especially on the islands. The trees close to the water line are starting turn yellow and the grasses on the granite slopes are also starting fade. There were some minor changes in the weather, but it almost feels like the smoky conditions have had a dampening effect on the dramatic weather shifts. There were a couple of tough bites on a few of the afternoons, but overall, the walleye fishing was very good for both size and numbers. We continued to see very high numbers of 22 – 25 in. walleyes again this week. Even though we had 3 cabin spots open this week due to cancellations and many guides off the water, we still managed to catch and release 37 walleyes over 27 in., including 2 – 28s. Walleye volume continued to be very good with guide sheets reporting an average of 35 walleyes over 18 in. per boat per day. Usually at this time of year 95% of our walleyes are caught using ¼ ounce jigs tipped with minnows. Occasionally we would gear down to 1/8s for really difficult fish and “dead stick them.” We did catch fish with jigs and minnows this week, but we also did very well again with big jigs and plastics on deep sand flats. Years ago, we would have fished bouncers and harnesses to chase these walleyes, but recently we have had better overall success with ½ – ¾ oz. jigs and 5 in. Gulp Alive crazy legs jerk shads. With this big bait you can cover water quickly to locate active fish while you are watching your graph and locating pods of less aggressive fish that you can go back to and work with smaller jigs and minnows later. It is just another very efficient technique that we have been working on over the course of the season and now we are comfortable fishing this system down to 30 ft. and deeper. 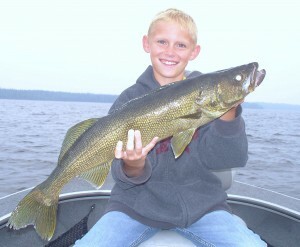 Many of our big walleyes this week were caught on the big plastics. There was very little effort put into chasing big pike this week and when we did, results were very modest. Wendi and Keith Dickerson brought their boys Josh and Logan up for the first time to fish with us this week. Every one caught at least a 27 in. walleye and Josh and Logan each caught their personal best walleye at 27.5 in.